The purple splotch equates to 70 inches of rain. For one, the Delaware River recorded its biggest flow year, by far, in ninety years of record keeping. The cause was a higher than normal spring peak (presumably from ample winter snows) and a brush with the Tropics in the form of Hurricane Irene. Why my fascination with the Delaware? For one, I went to college just next door, or rather just downstream, at the scenic confluence of the Delaware and Lehigh Rivers. I ran into a recent Lehigh College graduate at Naples Depot, who upon introducing myself, commenced into gloating to me about his college, located just upriver, had beat my alma mater, Lafayette College, for four years straight. "Yeah, but Lafayette is located at the confluence of two major rivers," I lectured him, "you can never take that away ... plus, I don't know if you noticed," and I knew that he hadn't, "both the Lehigh and Delaware recorded their highest flow years on record, in nearly a century of record keeping." "Hey, I'm just an electrical engineer." 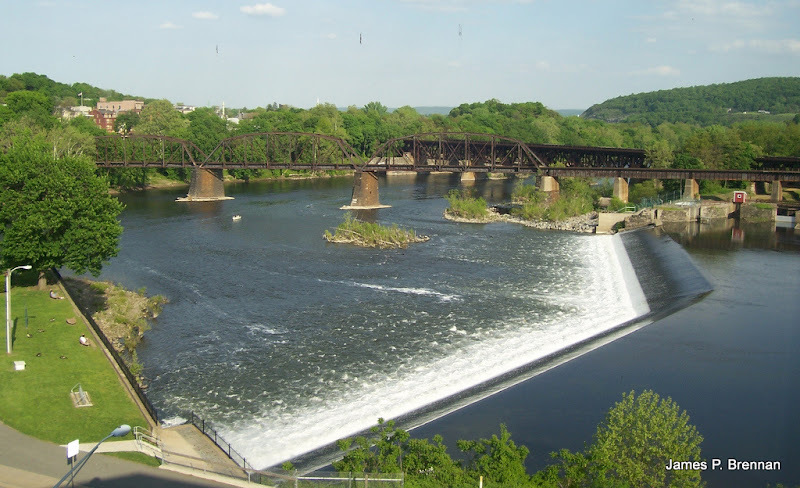 as seen in Easton, Pennsylvania, looking downstream towards Philadelphia. That's New Jersey in the background on the left. With a smile and a firm handshake, I wished him a healthy and hydrologic new year. "Don't worry," I assured him. "I'm happy to be able to inform a Lehigh grad."